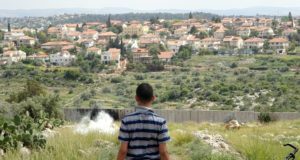 Villagers from Ni’lin defied an Israeli military curfew today to converge on the site where the apartheid Wall is being constructed on village lands. 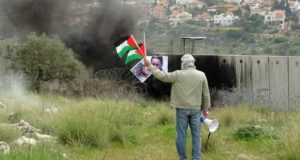 Some 200 villagers – men, women and children – together with international and Israeli solidarity activists, peacefully marched to the site where two bulldozers are clearing prime farmland and tearing up olive trees to make way for construction of the Wall. Predictably, the non-violent protesters were met with heavy violence by the approximately 50 Israeli soldiers facilitating the construction work, who began firing tear gas, sound bombs and rubber-coated bullets at the demonstrators. Scores of olive trees were set ablaze as the tear gas canisters landed on dry grassland. Five people were injured, including Hilal Abdel Khader, who was beaten on the back with rifles by Israeli soldiers. One other person was injured after being hit by a rubber bullet, and 3 suffered from breathing difficulties due to tear gas inhalation. Two men were arrested, including one of the protest’s organisers, Ahed Khawaja. Earlier in the day, some 50 Israeli jeeps invaded the village at approximately 09:30, imposing a curfew, forcibly closing down shops, and obliging residents to remain in their homes. 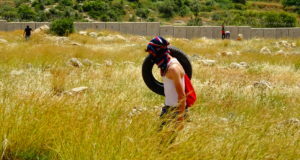 When residents left their homes in defiance of the curfew, Israeli soldiers began firing tear gas and rubber bullets. Tear gas was also fired at the local school that lies in the centre of the village, and several children were injured as a result. Local resident, Hindi Mesleh, said that he believed the curfew had been strategically timed to prevent widespread participation in the demonstration that had been planned for 11:30 that morning. Abdel Taher Fror, Khalid Abdel Karim Fror, and one other man were arrested in their homes by undercover Israeli police in a Palestinian car posing as door-to-door melon sellers. They remain under detention.